Cheri J. Meiners has written a number of great books for early childhood educators to share with their students, including twelve titles in the "Learning to Get Along" series. The latest two books I have had the pleasure of reading are no exception. Being Positive! and Feel Confident!, both to be released in September of this year, are titles in the new series "Being the Best Me!" At this time I cannot find any other titles for this series. 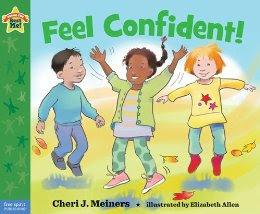 Feel Confident!, is a cheerful book about having confidence in one's life. It is a delightful book to share with young children in order to help them understand they are an important person, not only in their own family, but in the world. Confidence is not always a strong character element in people. I see this book as a means of helping to build this area of self esteem. At the end of this book there is a list of twelve ideas in order to remain confident in oneself. Also included are questions to ask as you read the book to create a dialogue between the reader and the child or children to whom they are reading. Eight activities / games with a confidence theme are provided in order to help promote a confident outlook on life. 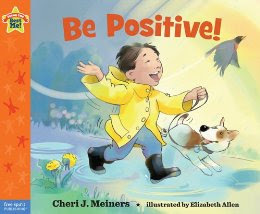 Be Positive!, is a cheerful book about having a positive outlook on life. No matter what happens during the day, you have to remember the saying "this too shall pass". As I read the text for this book for young children, this quote kept running through my head. Like Fish! for young children, choose your attitude. I think this is a nice way to start the day. Reminding everyone that if we are positive, we will feel much better about ourselves and the activities of the day. At the end of this book there is a list of twelve ideas in order to keep a positive outlook on life. Also included are questions to ask as you read the book to create a dialogue between the reader and the child or children to whom they are reading. Eight activities / games with an optimism theme are provided in order to help promote a positive outlook. I would recommend these titles to be added to an early childhood school library or public library serving young children and their families. This new series, along with Ms. Meiners's other character building books are a wonderful asset to any collection in order to help build children's self esteem and improve their social skills. *To comply with new guidelines introduced by the Federal Trade Commission, Free Spirit Publishing has provided a complimentary electronic copy of these books through NetGalley.com.